This year, ACE week took place between Monday, April 8 and Friday, April 12. Sigma Pi members performed random acts of kindness – such as bringing donuts to GVPD and passing out encouraging notes with candy to students in the Mary Idema Pew Library – and then posted a picture with the tag #SigmaPiACEWeek. Through the GVSU chapter’s acts of kindness, they showed appreciation for the whole Laker community, including students, professors, GVPD, bus drivers and other faculty and staff. A large part of ACE week is Sigma Pi’s annual Stuff the Buss event. On the afternoon of Friday, April 12, a group of Sigma Pi brothers stood around a large “Two Men and a Truck” moving-truck and collected non-perishable food items. All of the donations went to Replenish, GVSU’s food pantry. Donations were taken both on an individual and group scale. The organization that donated the most won a $100 award for their philanthropy or chosen charity. This year, the winner was GVSU’s Gamma Phi Beta, whose members donated 225 items. The money Gamma Phi Beta won will be given to the Building Strong Girls organization. By the end of their six hour stake, Sigma Pi members successfully collected more items than last year. 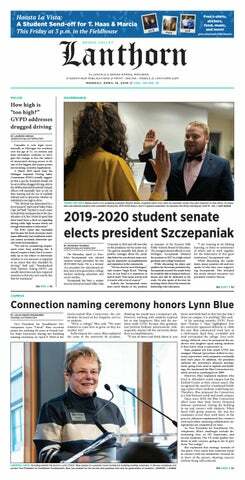 ACE week was largely successful this year, and through their acts of kindness, the Sigma Pi members showed their true Laker Effect.